Written by Jeph Loeb Art and cover by Jim Lee & Scott Williams The complete 12-part saga written by Jeph Loeb (SUPERMAN/BATMAN, Smallville) with art by fan-favorites Jim Lee & Scott Williams (SUPERMAN, Uncanny X-Men) collected together for the first time in the oversized Absolute format! This slipcased edition includes BATMAN #608-619 as well as the the 2-page origin of Batman (originally seen only on dccomics.com) and the special story from Wizard: The Comics Magazine. 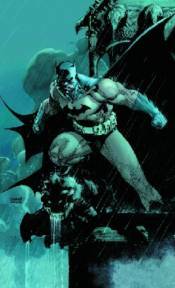 The year-long 'Hush' - an epic tale of friendship, trust, and betrayal that spans a lifetime - reinvigorated the Dark Knight, pitting him against the deadliest members of his Rogue's Gallery and introducing his newest foe! This Absolute edition includes an all-new cover by Lee & Williams, a Jim Lee Sketchbook, and issue-by-issue commentary by the creative team!